Whether you're an incoming college freshman, a busying high school senior, or an excited high school junior, anything that hints at the glorified life of college students is craved like comfort food. That craving is how I discovered the wonderful world of the college-prep section of Barnes & Noble. Here I found some amazing books that not only tell about what could happen in college, but also just general advice on friendships, family and being healthy. UChic pretty much covers everything any girl would ever need to know before going to college. From relationships to friendships, dealing with your roommate, and how to get involved, UChic has you covered! 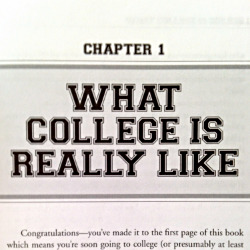 Definitely a must-read for any college-bound girl. Daphne Oz, daughter of the famous Dr. Oz, is the author of this amazing read. The book is not about dieting, it's about learning how to live a healthy life. Daphne explains what being healthy means for everybody, individually. She also talks about what's good for you and bad for you, food wise; some common myths about food; and also gives some great recipes you can make right in your dorm! This book focuses on your freshman year, so it definitely gets to all of your possible questions regarding your first year on campus. It even includes some tips on finding scholarships and signing up for classes. The subtle humor also helps making reading about finances and class a lot more enjoyable. I highly recommend these three books for anyone hoping to gain insight into college life.